First American Home Warranty has been an industry leader for over 30 years and has a reputation of providing quality home warranty plans with extensive coverage for homeowners across the nation. They’ve serviced over 13.5 million claims and have a large network of contractors. Monthly payment options are available along with a 30-day review period for new contract holders. Customer reviews are generally positive and reflect the First American trademark of putting customers first. The warranty coverage from First American Home Warranty is dependent on your geographic location but no matter where you live, the coverage is very good. They provide a ‘Basic’ plan, and a ‘Premier’ plan, all of which can be supplemented with various options such as well pumps or additional refrigerators if needed. All plans provides coverage for malfunctions due to lack of maintenance, rust, corrosion and sedimentary build-up. Annual premiums range from $300-$500 or more, depending on selected plan and options. Monthly premiums range from $28-$44 or more, also depending on selected plan and options. Although it is not immediately obvious where to find them, there are sample contracts available on the First American Home Warranty website. These PDF copies are very well laid out and make it easy to see what is and what is not covered by your plan. 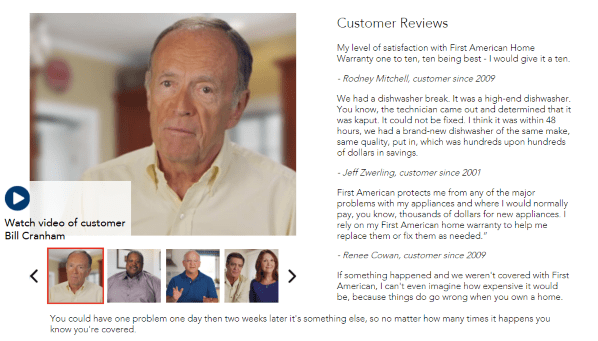 The website also features videos of homeowners discussing their experiences with First American Home Warranty. There are links to other sites where both positive and negative reviews can be found. This includes Trustpilot, Consumer Affairs and the Better Business Bureau where First American Home Warranty has been an accredited business for nearly 20 years. In line with other warranty providers, First American Home Warranty excludes pre-existing conditions and failures caused by misuse or a lack of maintenance. However, their sample contract reads “Our plans cover unknown conditions which can include rust, corrosion, sediment, problems resulting from lack of maintenance and much more!” and these issues are not covered by other companies. Also excluded is damage caused by “storms, war, riot, acts of God” etc, but again, this is in line with similar warranty companies. Limits of liability dollar amounts vary and selecting their First Class Upgrade can increase limits further. All limits are printed very clearly in the contract. First American Home Warranty has a vast network of pre-screened and independent service providers. They use local contractors, already established in their communities to ensure faster service for the customer and the opportunity to build a trusting relationship with those that work on your home. One unique program First American Home Warranty has implemented is a customer satisfaction survey which is used to monitor the performance of the contractors. If a contractor should receive consistently bad responses on the survey they are ‘let go’ from the program. Once your repair or replacement is complete, First American will warrant the contractor's work for 30 days. First American Home Warranty operates 4 claim centers and responds to nearly 1 million claims a year. 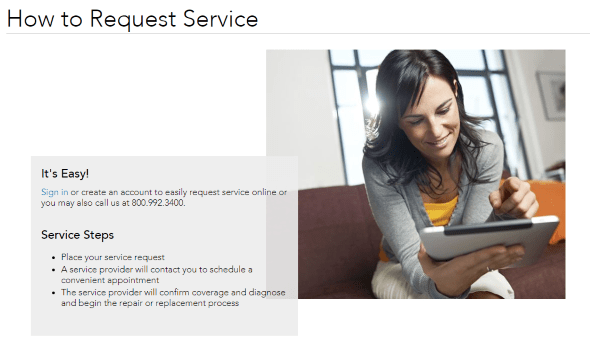 Claims may be opened online through their customer portal or telephone service is available 24 hours a day. Claim calls are dispatched to a contractor within 4 hours on a business day - unless it is an emergency. No written claim form is required before diagnosis of the issue begins and if a properly qualified contractor is not available within their network locally, you can be given authorization to hire your own contractor and the company will reimburse you. If you are looking for a well-established company that has a fast response time and offers a wide variety of coverage options then First American Home Warranty is for you. Their nationwide network of contractors and their 4-hour commitment means you won’t be left waiting for days to have your issue addressed. First American home Warranty can trace its roots all the way back to Orange County California in 1889. It was founded on the principle of putting customers first and eventually became First American Title and Trust Insurance Company in 1960. In 1984 First American Home Warranty was created as a specialist sub-division. They have protected more than 8.6 million customers and serviced over 13.5 million claims. In 2016 alone, they saved their customers from paying $171 million in home repairs and replacements.